Welcome to Snapshot Sunday! The blog post where I share a fabulous photo that captures our experiences of raising twins. Here are our baby twins when they were one month old. I can’t believe how squishy they were! Francis didn’t open his eyes for ages and Beatrice wanted to know what was going on from day 1. That is still very true for today! Our one month old baby twins. I love how squishy newborn babies are. What were your one month old babies like? Looking for more twin inspiration? 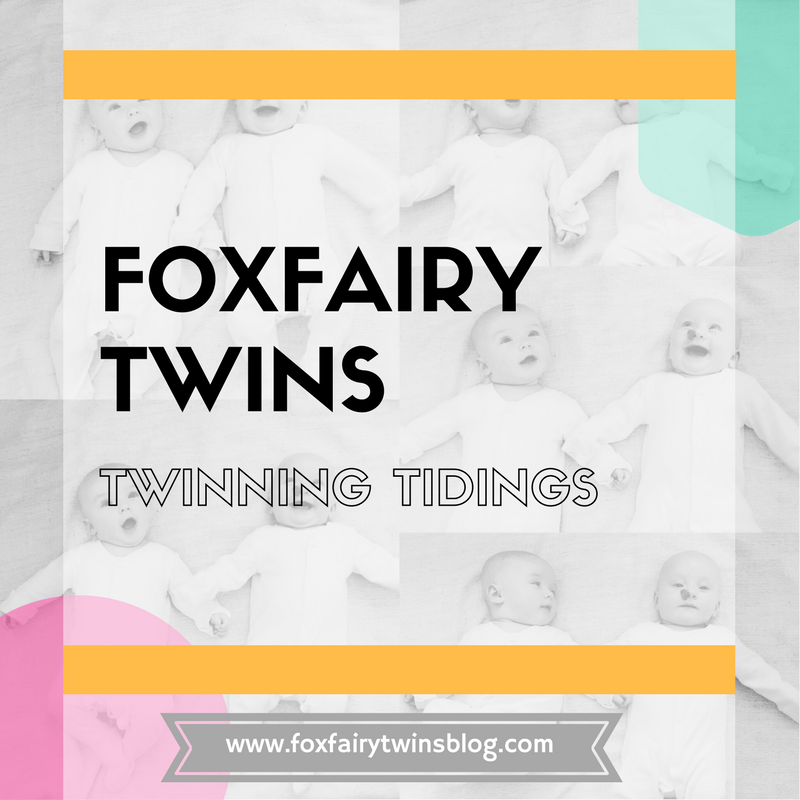 Browse our other twin topic pages from the links below, or come and say hi on Instagram, Twitter, Facebook, and Pinterest. We would love to hear from you! Seeing our babies for the first time will be something that I never forget. It actually took us a while to start taking photographs as we just wanted to look at them (read our Twins Hold Hands For The First Time to see one of our first photographs of our babies). Here are the babies, one day old, sharing their hospital cot. Absolutely delightful. Our beautiful baby twins one day old, sleeping in their hospital cot. What photos do you treasure the most? Daddy cuddles are the best. Here is Beatrice at only a few weeks old enjoying a snuggle with Pete. Don’t you find it’s watching your partner with your little ones is the best feeling in the world? Daddy cuddles are the best. What Is Your Favourite Photo? Do you have a favourite photo of your little one with someone else? If you follow us on Instagram at Foxfairy Twins you will know that one of our favourite baby activities is to read (more activity ideas in our 21 Activities for Babies post). From a very early age we started introducing books our twins. It’s never too early to start reading! Just hearing your voice aids language development, as well as promoting the pleasure of reading. One afternoon I left a book propped up next to Francis to have a look at. He was so interested in the book that he ended up sliding it onto his head! I hope this love for books and reading continues. Our babies love to look at books! We try and read to our babies every day so that they develop a love of reading. What activities do your babies enjoy? What Is Your Favourite Activity? What is your little one’s favourite activity? Finding out I was pregnant was a little bit of a shock to say the least… (if you haven’t already have a look at My Twin Pregnancy Story for the full details). One of the main things that really made me worry was the fact that we had my friend’s 30th birthday party all the way in Devon. I had just found out I was pregnant…and now we have to pack for the 5 hour car journey in the morning for a party…AND I have to get away with not drinking…eeek. Finding out you are 2-3 weeks pregnant the day before your friend’s 30th 80s fancy dress party! When Did You Find Out? When did you first find our you were expecting? Did you have any particular occasions booked that you couldn’t avoid? How did you keep your news a secret? As soon as the twins were born Pete went to look after them whilst I continued to remain in theatre for some time. Once finally out of there, I was desperate to properly see their little faces and learn what each baby looked like. I wanted to see the colour of their eyes and shade of their hair, the shape of their little button noses and to see if they looked more like me or Pete. Luckily the babies could stay with us on the ward as they were healthy and strong (how amazing is that? Especially for twins). It’s funny how the world revolves around capturing precious moments through the lens of your phone, yet Pete and I did not take pictures for a while. We wanted to actually live in this moment. The moment where we were with our brand new babies. No distractions please. This was our precious time. After being mesmerised by our tiny twins, we tried to have a quick nap (we had been awake for over 24 hours…). Suddenly the midwife called: ‘Quick! Get your phone! Your babies are holding hands!’ As Pete rushed for his phone I glanced over at the babies. It was the cutest thing I had ever seen. Our baby twins, who were one day old, were holding hands. Oh. My. Cue happy tears. New baby twins holding hands. I know it’s so important not to focus too much on getting the perfect snap and miss out on the fabulous moments your little ones bring, but I am so so grateful the midwife helped us to capture this incredible memory. What Was Your First Photograph? What was your first snap that you got of your little bundles of joy? Please Bear With Us: Blog Moving Soon!